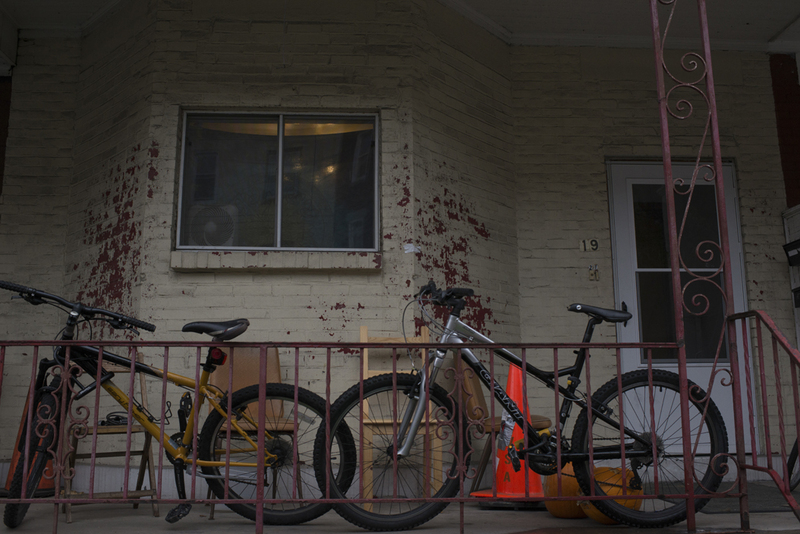 Six students moved into a rowhouse on Wellsford Street and met their unexpected new roommate –– a haunting spirit. Since August, when they moved in, the Wellsford Street residents said there have been a series of strange, inexplicable and creepy occurrences. While three of the tenants remain skeptical about the cause, the other three believe some type of spirit haunts the house. The students aren’t alone in their beliefs. Residents of several homes in the Oakland area claim to be haunted by ghosts or ghouls and — in addition to homes — campus buildings including Holland Hall, the Cathedral of Learning and the Carnegie Library come with their own set of haunting tales. On the front door of the Wellsford house, a picture of Food Network star Guy Fieri peers out of the small diamond-shaped window. The picture of the spiky-haired restaurateur alludes to the youthful humor of the college students inside and starkly contrasts the aging 116-year-old home. The white paint of the house is worn in some spots. By day, it bleeds the dark red color of the original brick that lies underneath. At night, this detail is concealed in shadow. On a cool evening, the street is dark, quiet and empty, seemingly peaceful. Matt Sergison, a senior neuroscience major, and Gordon Ridgeway, a biology and Spanish double major, are the most convinced that the house is haunted. Ridgeway has had ghostly encounters in the past. When he was in eighth grade, he and his friend spotted a man in what looked like a Civil War uniform riding a horse through the woods, he said. When they walked through the trees into a clearing, the man was nowhere to be found. Ridgeway said this past experience with what he believed to be spirits and ghosts has given him a sixth sense for the supernatural. “I came to this house, and I was like, ‘Oh jeez, there’s going to be some stuff,’” Ridgeway said. The first thing they noticed was a light bulb in the entrance hall, which flickered incessantly when they flipped the switch. According to Sergison, sometimes the bulb had a mind of its own. One of the current tenants of the home, Bryce Cooper, a senior biology and philosophy major, recalled that the landlord once tried to fix the light bulb issue but couldn’t figure out how. Besides the flickering light in the entrance hallway, Sergison described strange noises in the Wellsford house. One day, he was sitting in the living room when he heard mumbling outside the front door. He went to see who was outside and discovered — nobody. “I was just kind of was like, ‘I’m not going any farther in this. This is just too freaky for me,’” Sergison said. Cooper, who said he doesn’t believe in ghosts, said there were some occurrences even he could not explain. Last Thursday, he felt a cool draft on his back at night while sleeping. He looked at his ceiling fan, and it was off. He looked to the flag on his window, and it lay still. Cooper said he has felt the draft every night since then. “I don’t believe in ghosts — like at all — but for someone who would believe in ghosts … you know,” Cooper said. In another house on Dawson Street, the current tenants are convinced a ghost — who they’ve nicknamed the “Ghost of Dawson” after the street they live on — is still hanging around. He has been known to flicker lights, make banging noises in the basement and move small items around. Tori Maatta, who lives on Forbes Avenue near the CVS Pharmacy, claims a spirit that makes strange buzzing and cracking noises haunts her apartment. The whispered rumors about the home on Wellsford Street –– and another home the six residents lived in last year on Atwood Street –– go so far as to say previous residents died in the houses. Creepy as these individual tales may be, this aging steel city comes with several harrowing tales of its own. Haunted Pittsburgh, a company that leads ghost tours in the Downtown area, is in its eighth year of tours and not without subject matter. The Downtown tour includes well-known institutions such as the famous Omni William Penn Hotel, the former Allegheny County Jail and the federal courthouse. Kathleen Mullavey, a tour guide at Haunted Pittsburgh, said the Carnegie Library in Oakland, the Cathedral of Learning and Holland Hall all have their stories. But for Mullavey, the most intriguing place on Pitt’s campus is Bruce Hall, formerly the historic Schenley Apartments. As the story goes, the owner of the apartment building lived on the 12th floor. Both his wife and mistress took their lives there: One jumped to her death, and the other hung herself from a balcony behind the fireplace. The 12th floor is the only floor in Bruce that has not been remodeled as a dorm floor. It retains the ornate look of the past with arched entryways, elaborate crown molding and hardwood floors. One room on the floor, suite 1201, generally remains locked — the room where students believe the two women met their fate. Canard Grigsby, interim university architect and senior project manager of Pitt’s Department of Facilities Management, said the infamous suite 1201 is currently the home of the Office of Special Events. He described the story of the suite as a mixture of urban legend and nonfiction. “[The] tales are shrouded in mystery and filled with conjecture about what did or did not happen in the suite related to sordid affairs, egregious acts of infidelity, faint voices and faulty mechanical equipment,” Grigsby said. On Oct. 13, around 11 p.m., Rebecca Ruben, a first-year business student who lives on the ninth floor of Bruce, visited the 12th floor with her roommate and Resident Assistant, Tiffany Coury. Coury, a senior, had seen on a friend’s Snapchat that suite 1201 was open, although they did not know why. Coury recorded their visit with her cellphone as she, Ruben and another friend explored the former apartment. At one point, the girls discovered an open window. “[The open window] was really creepy, because the rumor is that she may have jumped out the window and died,” Ruben said. In the video, the girls burst out laughing, and the echo of the laughter fades. Then, a scream fades in. They didn’t notice the sharp screech until they watched the recording later that night. “[Pittsburgh has] a character forged in pig-iron furnaces so hot that men and women sometimes forgot their fear of hell,” Mullavey said, reading from her tour script.